20 years ago, the Ford F-250 of the time measured in at 221 inches of minimum length, 78 inches of minimum width, and 73 inches of minimum height. It could maybe achieve 19 mpg highway, and was rated to tow 9,800 pounds with its 7.3L Power Stroke diesel engine, at the time rated at 225 hp and 450 lb-ft of torque. Seeing as the recipe for a good life involves context and constant improvement, we’ll fast forward to the present. Except we won’t look at the F-250 of today. Instead, it will be the 2018 F-150 Power Stroke diesel, which might be the best modern take of a more classic Ford Super Duty truck, but with cutting edge modernization. Here’s why: the 2018 F-150 Power Stroke carries close proportions to the old Super Duty. It comes in various lengths similar to the 1998 F-250, is actually wider by two inches, and has a minimum height of 75 inches. Then there’s the 3.0L Power Stroke diesel engine. With two less cylinders, and less than half the displacement of the old 7.3L Power Stroke V8 found in the tenth-generation F-Series, the purpose-built diesel engine commands 250 horsepower and 440 lb-ft of torque, backed by a 10-speed automatic transmission that optimizes the power band in ways that old trucks can only fantasize about. 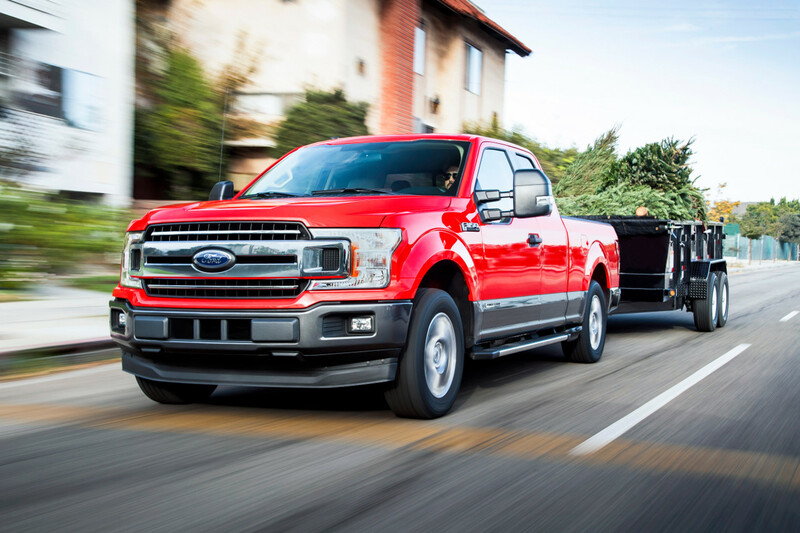 Meanwhile, the current-generation F-250 and F-350 have morphed into gargantuan behemoths of personal use, coming in at nearly seven feet tall, and over 22 feet long. With 935 lb-ft of torque on tap. There’s clearly room for a diesel variant of the F-150 to slot in below this space. The 2018 F-150 diesel,in the proper configuration, is rated to tow 11,400 lbs. That’s significantly better than the old Super Duty, and it comes with class-leading creature comforts that, compared to ten years ago, were unheard of for a truck. Bluetooth? Wifi? Digital information readouts? Adjustable pedals? A comfortable ride? Good luck. While we didn’t max out the towing abilities of the F-150 diesel around the high-elevation landscape outside of Denver, Colorado, we did hook up a 5,500-lb. horse trailer, sans horses, to pull around the countryside. In city traffic, and during those needs of maximum acceleration, the F-150 diesel showed strong levels of confidence. Strong like an ox. Really only in sections where the road got a little unrefined did we notice there was a trailer back there, and we had no problems keeping pace with traffic. Admittedly, with only 250 hp on tap, passing requires ample portions of both timing and patience. And at the end of our 23-mile driving loop, which lasted 36 minutes, we averaged 13 mpg, which was a stark contrast from our incredible hypermiling achievements. It could have been the hills, the hard acceleration, and the elevation all playing against the 2018 F-150 Diesel, but regardless, the performance is satisfying. For those that want a 2018 F-150 Diesel, it becomes available on Lariat trim levels and above. 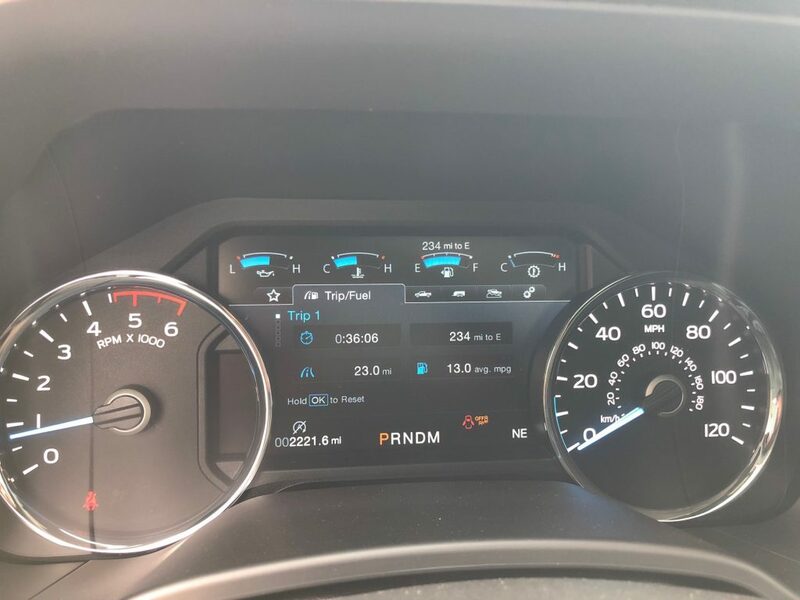 The premium of which is $4,000 more than the standard 2.7L EcoBoost on Lariat, and is a $3,000 option over the standard 5.0L V8 on both the King Ranch and Platinum trim levels. So basically, no cheaper than $46,410 for a personal tow rig. It actually out-prices the 2018 F-250 XL Power Stroke by a few hundred dollars, which again, comes with 900 lb-ft of torque, but will lack the creature comforts of the premium F-150 trim levels. In short, if you’ve got $46-grand burning a hole in your pocket for a diesel Ford pickup, you now have the option between two distinct trucks. The 1998 Ford Super Duty reincarnate, or the behemoth 2018 F-250. Great little diesel engine that would be a great addition to the f150 lineup if only it were available in all the trims and configurations that the base 3.3L and 2.7L Ecoboost are found, but instead, just like was the case with the Ram Ecodiesel and baby Duramax, this engine is also misplaced and overbilled in its capability level to justify its high price. When and if engineers figure out how to build and certify these mid-level performing diesels much cheaper than today, will we get some great pickup choices with a great diesel engine at a reasonable price. F150s start at 27.4K MSRP. For a grand more, one can add an amazing 2.7L Ecoboost with 400 peak ft-lb torque and 26 mpg highway. If one could opt for this 3.0L PowerStroke for $4K over the base price in a work truck, it’d fly off the lots at $31K plus destination, but instead, it starts at $46K in versions so massive that it’s underpowered and under achieved mpg wise for it’s intended target market.